It’s the holiday of fluffy white bunnies, painted eggs, chocolate, marshmallow chicks, baskets, and hunting for painted eggs. So here’s a picture of Geoffrey the Giraffe surrounded by many fluffy white Easter Bunnies. That sing. And Geoffrey the Giraffe sounds like Tom Hanks, but is actually his sounds-alike brother, Jim. 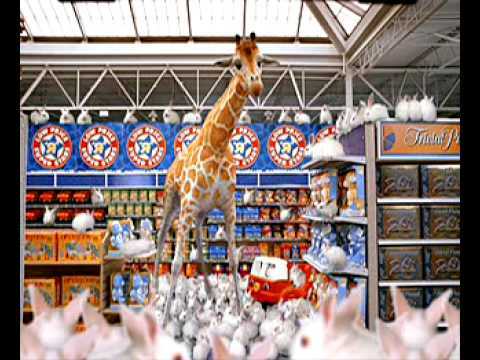 I just shed a tear for Toys R Us going out of business, and people wondering in 2003 (and 2004) why Tom Hanks was doing Toys R Us commercial voiceover work. Anyway, try not to let this get you down completely. Enjoy your Easter, and of course, remember the reason for the holiday beyond what people love about Easter most.